More than 17.000 people watched the live comedy shows over 2 days. No one - not politicians, pop stars, TV and other celebrities and well known faces - escaped the hilarious, cutting-edge, incisive humour which poked fun and parodied the trending topics of the moment. Luc Peumans from Painting with Light created a bespoke digital scenery concept for the first “Tegen De Sterren Op” live show a year ago (at the nearby Lotto Arena) and this was utilized again to replicate the large golden portal that is instantly recognizable from the TV show. Luc Peumans designed a set with a theatre look LED, surrounding a 2 piece moving 7mm LED screen, some LED portals and band risers... Images were composed of 3mm LED. A custom build of d3 drove the whole show with an average of 20 HD layers throughout the whole show on a 4×4 pro media server. Painting with Light has recently made a substantial investment in d3 Technologies, and the system proved its adaptability and power during the intense programming period that started two weeks in advance - and continued on site, with sketches changing right up until the last moment to keep the action completely current with the latest news and developments. 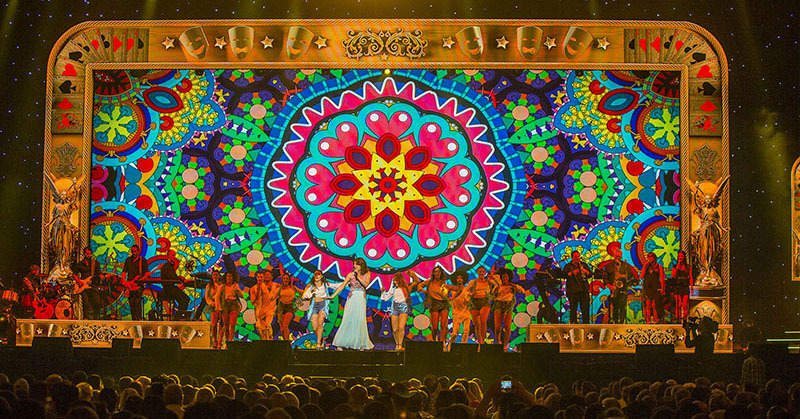 All playback video content like intro loops, stings, logos, motion graphics and digital branding used in the show was created by Painting with Light’s Michael Al Far. Painting with Light provided a custom built subtitle generator, running on Coolux Widget Designer. Controlling its own opacity in d3 through Artnet, and updating d3’s web module at every next song phrase. Jo Pauly from Visual Solutions programmed the whole show from scratch, playing out audio tracks, comedy content and actor’s interactivity. The system was communicating with sound/light through Artnet, Midi, MTC, and TCP/IP.